Two common and pestilent Daedra, Scamps and Clannfears are both not only prevalent in previous Elder Scrolls titles but will also be found in the Elder Scrolls Online. While vastly different, the two share similarities such as the realm of Oblivion from which they come, and their annoying tendency to constantly pester a player while he or she is trying to casually stroll by an open Oblivion gate. This addition to the "TESO Creatures" series will delve into what exactly these two monsters are and where to find them. If you haven't already, be sure to check the links below to catch up on the previous articles. For those of us who played Morrowind or Oblivion, Scamps are no strangers. The odd little creatures were found in an annoying abundance throughout the course of both games and now, thanks to a video released by the developers, we know that they have weaseled their way into The Elder Scrolls Online as well. Scamps are horrid little servants of Mehrunes Dagon that are often found in small groups so they can ambush the player. Their low intelligence and overall weakness, however, gives the assailants a dramatic disadvantage. Given the description written in the previous sentences, you may believe I have a distaste for Scamps. In truth, they are a piece of nostalgia I will enjoy beating into the ground in the next game. The Scamp is a low level enemy with the ability to summon fireballs for long ranged damage and use their claws when getting in close with their enemy. Alone, they are hardly anything to worry over, but these creatures can sometimes be overwhelming in groups. Previous Games: Found in both Morrowind and Oblivion, Scamps are short and skinny monsters with an unnaturally hunched posture. Their lower bodies and tails are covered in dark patchy hair, and they have long, weapon like claws on their hands. Their faces are reminiscent of a rodent’s, but with large gaping mouths full of razor sharp teeth. Elder Scrolls Online: Staying true to the past, the Scamps in the Elder Scrolls Online are very similar to the ones in Morrowind and Oblivion. They added a bit more personality to the Scamps, and I personally adore the minor changes in their appearance. Watching the video and seeing some of the concept art makes me think of some sort of monkey in the way the creatures move. If anything, they look more menacing than they ever have in previous games. 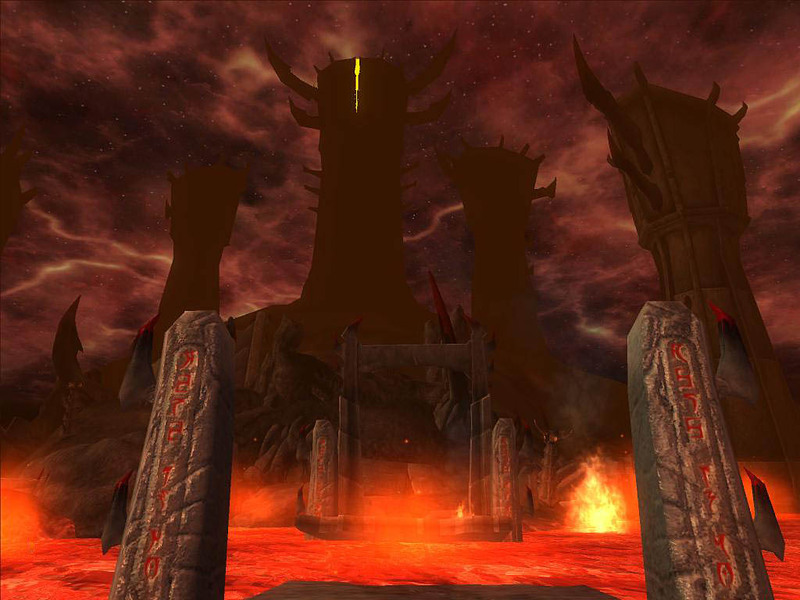 Previous Games: We know the Scamps best in their home of Mehrunes Dagon's realm of Oblivion. However, there are instances in the game where you find them in caves or in the surrounding area of an Oblivion gate. In both Morrowind and Oblivion, the little guys are also a summoned creature so you can see them virtually anywhere. Elder Scrolls Online: Presumably, we will not see Scamps in their natural planes of Oblivion, as it is not known whether or not we will ever be able to see Mehrunes Dagon's realm in the Elder Scrolls online. However, we can most likely look for them in various ruins, caves, and places that correspond with their usual habitat. I hope to see hoards of these awful creatures to decimate with friends while playing the Elder Scrolls Online. While I know I will enjoy the appearance of the Scamps, the noises they make still get to me. Perhaps they will prove to be more of a strategic challenge, utilizing TESO's unique battle technology talked about in the gameplay video to strike at an opponent while vulnerable. The Clannfear is best known for its time in the Elder Scrolls Oblivion, as one of the creatures which guarded the Oblivion gates. The dinosaur-like monsters were also shown in Morrowind and the older, less popular game, Battlespire. They were not an uncommon enemy, and now we will see them again in The Elder Scrolls Online. The Clannfear relies a great deal on it's deadly tail and teeth to attack, as shown through the Creating ESO: Clannfear video released by developers earlier on this year. In Oblivion, their skin made them resilient to many forms of magical damage. In Morrowind, they were able to endure many hits but lacked any form of agility. Previous Games: Clannfears are reptilian creatures with a row of deadly teeth and scaly hides. There is a definite prehistoric air to the Clannfear, from their shrill noises to their strange, lizard-like eyes. On the tops of their heads, Clannfears have large protrusions which act as scaly shields. Their arms are practically non functional, as they are very small and have a limited reach. Elder Scrolls Online: While the Clannfears many of us recognize are a sort of yellow or very pale green, the ones seen in the Elder Scrolls Online take a mixture of this and the earlier game, Morrowind, and mimic the dark green scales of the creatures found there. They have about the same body shape as those we see in Oblivion and are not much shorter than an average sized player character. There are changes in the shape of the creature's head, as it now resembles that of a prehistoric predator. Previous Games: The Clannfear remains ambiguous as to where they dwell exactly. While in Oblivion they can be found in Mehrune's Oblivion realm and scattered arbitrarily throughout the wilds, Morrowind's Clannfears were more scarce. They could be located in different caves, coastlines, and largely uninhabited and barren areas. Elder Scrolls Online: While there was apparently no theme to the location of the Clannfear, the Elder Scrolls Online has taken another turn to make the creatures more easily found, it seems. From the video, the Clannfear is depicted in forest regions which are obviously not a rarity in the Tamriel, so they will be found rather commonly. Much like the Scamp, I would love to see groups of Clannfears to prey on unsuspecting players who tread too close to them. With the new direction they went with the art-style, this mob looks like a predatory brute, and I hope it lives up to its threatening appearance. Additionally, I would hope for us to learn a bit more about the creatures. We know they are daedra, so why do they choose to live among us, and why have they adapted to this way of living? Clannfears were never a prominent feature in my Oblivion playthroughs, thus I have no lasting memories of them. Scamps were never the most exciting enemies to battle in either game we saw them in, but I do remember them. Their fireballs were more of an annoyance than an actual threat at high level, and don’t even get me started on how tired I was of the creatures by the end of the Oblivion main quest line. Still, I can’t help but love the ugly little things. Some of my fondest memories of Morrowind stem from one Scamp in particular. Creeper the Scamp (one of two non-hostile mob merchants in Morrowind) was always there for me, awaiting my patronage. Standing with his Orcish counterparts in an Orcish manor in Caldera, Creeper would buy virtually anything I threw at him - no questions asked. He merely exchanged the often outlandish items for cold, hard cash. I owe Creeper my thanks and a large sum of gold due to his non-existent mercantile skills. I will see to repaying him one day. Do you have any experiences you would like to share? Leave a comment! As always Brilliant article Blythe! A Hyeise!!! To you! Thank you very much Isilmo! I certainly understand where you're coming from in regards to the Clannfears, they were sort of like a rarity that nobody really acknowledges as an important creature in-game. Honestly, Morrowind had the best Clannfears & Scamps IMO. There's something about the clannfear being green that fits in a way. I always liked clannfears, but they are very beastlike so similar to the Daedroth - I never really saw them in any of my Morrowind or Oblivion playthroughs. . I feel like the most common enemy I ever faced in Morrowind was always the Dwemer machines. I share an opinion I think other people share that the clannfear is a bit too raptor like. . They changed the beak with teeth to just a mouth with teeth, and they severely stunted his plate head. I know that they're Molag Bal's creation so they ought to look different. . but they made them a bit OVERLY different if you ask me. As far as scamps go, I think they did a good job except for making their mouths permanently open. I always saw scamps as the second most humanoid daedra there are. . and - again - they might be straying a bit far from that. I like that they're branching off from past ES games (which we all saw how little they did with the atronachs), but the direction they're going seems a little. . . overdone. As if they're trying to distinguish each daedra more so then each variation of previous elder scrolls games did. Keep up the great work, Blythe! It seems like there's some sort of pattern here, as nobody remembers Clannfears! I can see where you and other people may not be particularly fond of the new style of them. Their heads are certainly very different. As for the scamps, while I like their sort of animal-like form, I never regarded them as more of a humanoid - probably because I loathe them. I do understand where you're coming from though! I've been playing Oblivion,and I have to say this for the Scamps and Clanfears...I hate them. Just too many, and are hard at first. When I played Oblivion, I started closing gates at the level that resulted in Clannfear being ubiquitous. They had a very, very nasty attack sequence. They could drop kick you, knocking you back and momentarily stunning you. While you were stunned they would run up and bite you. Just as you were ready to attack, they would drop kick you again. I remember being dropkick/bitten three times in a row by several Clannfear. While in Oblivion I would use invisibility to go around all the clannfear. The towers themselves usually had the armored humanoid deadra and they were easy kills.